Up till now, Kristen Callihan is one of the two authors in 2012 who instantly shot to my favorites list with the first book I read by them. In Firelight I was entranced by everything that story had to offer me. 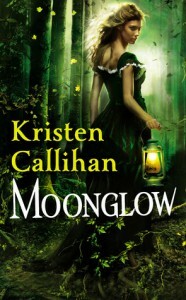 In Moonglow, Kristen Callihan ups the ante even more, which I didn’t think was possible! Characterization, plot, world and romance development, four basic story ingredients that in the hands of the right author means being whisked away into another exciting world, experience rip-roaring suspense and witness an epic romance ignite. 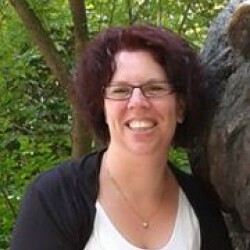 Kristen Callihan is such an author! From the first page I was thrust into a scene of brutal murder. The hero and heroine met and their combustible personalities created verbal firework. The overall plot arc in Moonglow takes such an exciting turn with poppy and inspector First Class, Winston Lane at the lead. The more I read, the more I wanted to know, the more I found out, the more I was engrossed by the story unfolded! It almost felt addictive. Ian Ranulf is nine degrees of complication that made him an incredible character to unravel. His issues enabled the reader to gradually see very deep in to the persona, what made him tick, where did he come from on certain matters. He’s gruff and coupled with his, at times, wild mannerism gave him a dangerous edge. One minute Ian shows intense emotions and the next he’s completely feral. He kept me on my qui vive how he would react, act and fall in love. He surprised me in more ways than I can count which made him such an exciting male lead to get to know!! Daisy is a woman I could connect with. I love the women, Kristen Callihan portrays in this series. When I think of the sisters in this series I’m somehow reminded of Lisa Valdez’s Dare sisters. Their capable, strong, talented, opinionated, passionate and in the case of Daisy and her sisters, come with a unique gift. Daisy gave as good as she got opposing Ian. I loved their verbal sparring. The fact that she played an integral part in the investigation. Her personality practically burst from the pages and her intensity really resonated with me. Daisy and Ian together are two bold distinctive persona’s, they clash and they let the other know exactly what they want. The dialogues between them is alive with emotions. It was so good to see them almost at opposite ends and see the feelings blossom. Their bickering gradually transforms in to a deeper emotion. Their chemistry burned between them and it made the sensuality spine-tingling good. I felt the love bloom between Ian and Daisy. It wasn’t instant but rather a process of strong wills succumbing to the powers of love. The imagery, Kristen Callihan portrays in the mind’s eye was vivid, alive with a spectrum of feelings and it made it all very easy for me to envelop myself in this world she created. If the romance spoke to my heart then the world building spoke to my imagination. I thoroughly enjoyed what Kristen Callihan brought to Firelight in terms of world building but she knocked it out of the park in Moonglow. The depth and layered diversity intrigued me. The new characters introduced brimmed with personality and I couldn’t get enough of it. Especially the secrets revealed in Moonglow were mind blowing and had me gasping in shock at the revelation! I wanted more with each chapter read, it was a compulsion I couldn’t ignore! The plot played a big part in revealing all the new. It also added tension to the whodunit plot. Often I get a sense with the clues uncovered where the author is going, this author however inserted the surprise factor with her plot. At the end I was “OMG”, “You got to be kidding me”, “No, no, nooooo”, and then I was crying. I was so engaged with these characters, what they had to endure and uncover, and it was all due to the incredible writing style of Kristen Callihan. When an author can establish such a strong connection between me and the story she has to tell, well, that is the author I would love to read stories from over and over again!! Moonglow took my breath away with its beautifully captured romance, the spine-chilling plot, the amazing world, but most of all, the phenomenal characters who wiggled their way in to my heart. Her free hand, heavy with languor, drifted along his arm and he trembled softly. Strengthened by it, Daisy pulled herself up. Fear me. Besides her, Conall looked at her if seeing a ghost. She smiled with grim satisfaction, the feeling of fearlessness like a drug in her veins. Run away, little wolf, or I shall kill you.